Thank you to everyone who has shown an interest in joining Yen Hall Farm Racing for this season. Two of the horses that will be part of it ran well during the last week. Firstly, Bisoubisou ran at Huntingdon with Sean Bowen riding. Bisou was bought for William to ride in amateur races, but she needed to run and of course there was not an amateur race to be had, so she went into a handicap hurdle over 2m4f. Her recent form had been a little hit and miss so when she joined us, we gave her a bit of a break. 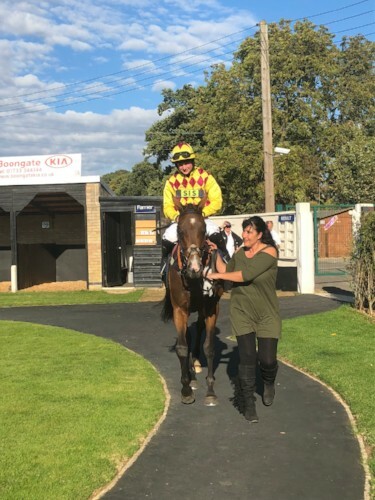 This was her first run for the stable and I was in two minds as to whether to run as she would really like some cut in the ground, but it was the first meeting back at Huntingdon and the grass cover was lovely on the course, so I decided she could go and we would see what we had. She went off at 50/1 in a fifteen runner race and ran extremely well to come third. Sean loved her and does not want me to find any races for William as he says she will win during the season. She showed a great attitude and tried all the way. You can’t ask for more than that. The second horse that will run for the club is Highway Star. He is a tricky character who always works well at home, but until now had not really put it together at the races. His last run was disappointing, but Nick Scholfield got off and said he needed a wind operation. We went ahead and did one and last week was his first run back. He ran in a 2m novice hurdle and went off at 25/1 and also came third. Nick rode him again and said he was a completely different horse who will certainly win races. Nick gave him a lovely confidence building ride and he has come out of the race very well. Both Bisou and Star will run again towards the end of the month. The club will also have three point to point horses in it which will include Legend to Be who needs no introduction, is the ultimate schoolmaster and wins every year, Local Show who is a top class horse who will go pointing and hunter chasing, and Hidden Passage who is a maiden pointer, but should also progress to hunter chasing. These three horses will be ready to run at the start of the pointing season in December. There are a few places left so do get in touch if you would like to be part of this exciting club. It is great value for money and great fun! Although we have not had any rain yet there is a little forecast for the weekend so we might have a few runners next week if the ground is good enough.Potentially Virnon and Avocet could be at Huntingdon on Tuesday, and The Happy Chappy could make his seasonal reappearance at one of several meetings towards the weekend. Fingers crossed the weather is kind to us!